Looking for sample invoice templates? We've got you covered! Do I need more than just a sample invoice template? Need a sample invoice to send an estimate to your client? You're in the right place. But we have more than just a regular sample invoice template. At ZipBooks, we walk you through all of the necessary information to include in the invoice. That means not accidentally leaving out any necessary information for your clients. There's also a section just for notes and terms, if you need to get a little more specific. 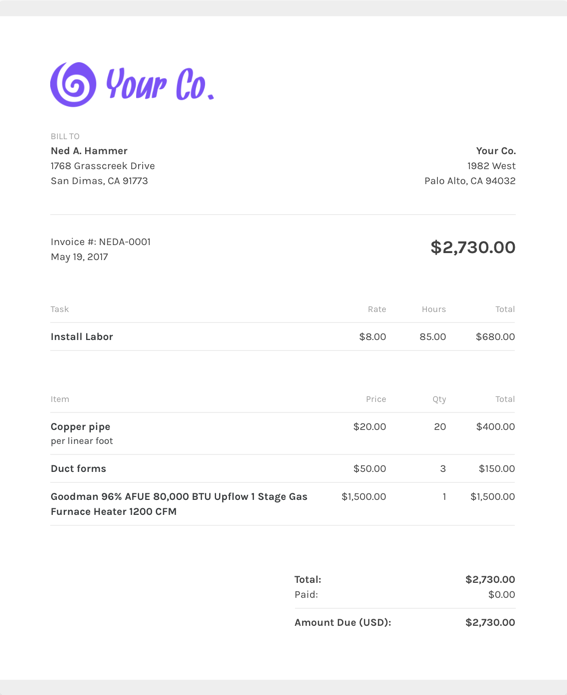 What should I include on my sample invoice template? One popular feature that ZipBooks is that you can save default settings for your invoices (like company logo and header and footer color) once you nail down the invoice details. Using ZipBooks for your sample invoice means never sending off an invoice without your own company information on it (oops!). We’ve collected data from tens of thousands of invoices and use it to score your invoice based on what information you include so you’ll get you paid faster. Why should I use ZipBooks’ sample invoice template to create and send my sample invoice?